Be Part of a Brand New Group! Benny Friedman and Yitzy Spinner Working on Choir. 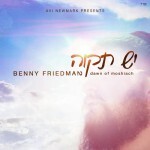 Three years ago, Benny Friedman released his debut album, Ta’amu. 12 songs, mastered to perfection, an instant best-seller. Using a large variety of musical styles, Ta’amu was a unique album bringing us all different types of songs and introducing us to the nicest voices in the Jewish Music World- Benny Friedman’s. While some may have viewed Ta’amu as just an introductory album to demonstrate Benny’s amazing talents, the sales showed that it was no ordinary album. And now, the team of Avi Newmark and Ian Freitor once again have teamed up to bring us Yesh Tikvah. Featuring compositions by Ari Goldwag, Bentzi Marcus, Elimelech Blumstein, Yitzy Waldner and more, plus backup harmonies by Yitzy Spinner, and even an appearance by Aryeh Kunstler, Yesh Tikvah is sure to please Benny Friedman fans of all ages, and even some who aren’t (yet?) fans. Yesh Tikvah: It’s quite possible that I’m behind with the times. Very Possible. Yet for my personal taste, I would’nt have started the album with a ‘techno’ sounding song. The first song is the first impression of any album, and I wouldn’t have thought that ‘techno’ is the desired impression of this album. That having been said, the title track Yesh Tikvah is a very catchy, enjoyable, ‘pumping’ song that’s bound to have you moving with the beat and most probably humming and harmonizing along! Composed by Ari Goldwag, and arranged by Ian Freitor, Yesh Tikvah is a ‘cheer-up’ song which is basically saying that no matter what is going on, Hashem is always with us and He controls everything. There’s no point in feeling down, just smile and have hope/ faith that everything is going to be ok. It’s definitely a catchy song which is likely to bring an unknowing smile to your face. Haboicher: Having started strong, the album pitches us another fast song. Composed by Bentzi Marcus and featuring backup vocal by Yitzy Spinner, Haboicher is a guitar based song which, while it may not be so easy to sing, it’s definitely easy to listen to! This isn’t exactly the ‘style’ with which I would have associated these words from Yishtabach, but it’s a great song nonetheless. Catchy, rocking, good job demonstrating Benny’s talents, and great backup vocals throughout, Haboicher is another solid song. B’sheim Hashem: Off to a solid start, we now get our first slow song of the album- B’sheim Hashem. In my opinion, this is the nicest song on the album without a question. Beginning with a solo by composer Marc Levine with just a guitar in the background, this song has a very soothing feel to it which definitely works with the words. (Side point- almost every B’sheim Hashem song that I’ve heard has been nice.) Don’t be surprised to hear this tune at many a Chuppah in the near future.! I especially like how there are no drums in this song until the crescendo at around 4:20, and yet the song doesn’t sound empty. I also like the musical piece by the beginning of the 2nd low part, as well as the 2nd high part (instead of singing). I kinda feel that without it the song would feel to slow and repetitive, whereas now it’s a really pretty song with nice soft harmonies. It’s simply a beautiful song topped off with a great crescendo which really shows off Benny’s amazing voice as well as ending the song perfectly. 5 star song, no question. Maaleh Ani: Something worth mentioning at this point… This album so far has a subtle detail that many albums lack- the songs actually flow into each other really well! And that trend continues as we roll into track 4. Composed by Elimelech Blumstein, Arranged by the amazing guitarist Aryeh Kunstler, and including backup vocals by Ari Goldwag, Maaleh Ani is definitely up there as one of my favorite songs on the album. I can’t quite put my finger on what it is that makes it so good; it just is. It’s a very catchy song, nothing weird, not prolonged, just solid through and through. Another great song; 4-4. Sholom Aleichem: Not a bad song, but not at all my style. Being that I tend to not like songs that others love (see: review of NYBC), I’m just going to plead the 5th (sorry OoT and R’DW), decline to comment, and skip over Shalom Aleichem. Mamleches Kohanim: Great example of why we can’t put TOO much value in an audio sampler. While I liked Maaleh Ani and Dawn of Moshiach right away, upon hearing the sampler I expected to dislike Mamleches Kohanim. I’m happy to say that I was wrong. (About Mamleches!) Another composition of Elimelech Blumstein’s, and arranged by Ian Freitor, Mamleches is a pretty good song. Yes, it does start off a little weak. Yet my younger brother, who complained as we listened to this album while decorating our Sukkah that he immensely disliked this song, walked in the 2nd time around and said, “Hey this is a really good song! What is this?” It just grows on you. While the beginning is a little shleppy, once the drums kick in at 2:19 the song is really quite good. The arrangement styling reminds me a little of 8th day somewhat, and a lot of Aryeh Kunstler, with the slow start which picks up and leads into a solid guitar solo, and somehow, by the end of the song, you just wanna listen to it again and again! There is one small issue with this song that falls under a pet peeve of mine, which is that it feelslike it’s lacking words. The 7 words seem to be repeated too many times….and while there’s nothing wrong with that, it does irk me in some songs. (That was one of the few things that I disliked in the album Ta’amu, it seemed to lack words.) However, big plus, I like the ‘Kohanim!’ that Benny calls out at the end of the guitar solo. All in all, Mamleches Kohanim is a very good song that I feel most will like (unless you just don’t like slow songs). While it’s not for everyone, it DEFINITELY works for me. Ivdu: And the flow continues! While it’s not as important for songs to flow into one another these days considering that many people bounce from song to song with their MP3 players, there still is much goodness in being able to just listen to an album straight through. Ivdu keeps up with this unusual habit of actually having each song flow smoothly into the next. Something in this song reminds me of Avraham Fried, maybe the low part? Whatever it is, I’m not complaining! Another solid, pumping song, Ivdu has a 1:04 intro which includes piano playing by Yaron Gershovsky. ‘Shticks’ and trills remind me of Shloime Kaufman’s work, but that may just be my imagination. While as whole this song is not quite up my alley, feels a little ‘off’ in my mind, it’s still managing to crawl its way up my ‘Most Played’ list. I’m voting it as my usual ‘I don’t love it, but everyone else does’ Song of the album. It IS a very good, pumping song that after the intro, you’re just not gonna wanna skip. Dor Acharon: I’m pretty sure that this is the first Benny Friedman song that’s taken me back to the 90’s era, with styles like you may remember from Dedi’s Rotzah (No, the OTHER one, the one from the Adon Hashalom album), etc. It’s a good song, nice flow, not a bad listen, but just not my tatse. That having been said, I DO fully expect it to grow on me and be constantly stuck in my head over the next few months. V’haviosem: I’m just waiting for someone to make a mashup of Vahavioisim and No Lyrics. Arranged by Ian Freitor, composed by Yitzy Waldner, and featuring backup vocals by Yitzy Spinner, Vahavioisim is a smooth song with arrangements sounding quite similar to the hit No Lyrics from the Ta’amu album. Yes, this one does have words. And nice harmonies- great job Yitzy Spinner! While Vahavioisim is not quite as catchy as No Lyrics, it’s still a nice, smooth song. It’s possible that it’s just not your style, not to your taste; but if it works for you, Vahavioisim is a good listen. Dawn of Moshiach: The other title track. Yes, you heard right…go figure! Perhaps the most ‘fun’ song on the album, Dawn of Moshiach is….well, different. It begins with Benny singing a poem about this dark night of Galus being replaced with the dawn of Moshiach. Enter: Guitars, drums, wind instrument. I particularly like how Benny manages to sing the low part in a voice that sounds like he’s continuing the story. Don’t know how, but it works. The best word to describe this song seems to be ‘fun’. From the trills and shticks to the harmonies, Dawn of Moshiach is catchy, pumping, and simply a fun song (as we’ve come come to expect from Yitzy Spinner- hear: Im Ein Ani Li, on AKApella 5). And I’m STILL not sure how they managed to throw in the ‘please’ at 4:21 without ‘missing a beat’! All in all, great song, very Avraham Fried-ish (just gutsier)…. Enjoy!! Berachamim: While I’m not usually a fan of just putting an existing song on an album, in this case I’m all for it. Berachamim was a single which Benny released with Ari Goldwag a couple of years ago. While it is quite a good song, it never caught on, so I’m happy to see it added to the end of this album. Composed by Ari Goldwag and including backup vocals by Yitzy Spinner, Berachamim is a very nice song, and a Tefilah that the Ribono Shel Olam please hear our Tefilos and end all the tears and suffering from this world. Good way to end off a really good album. After all is said and done, Yesh Tikvah is a reeaallly good album. While of course it’s not perfect, it’s sure to please all Benny fans without a doubt! Solid through and through, and not quite as ‘different’ as Ta’amu, this album is a very enjoyable listen, and I give it my vote for ‘Must Buy’ album. I can’t guarantee that everyone will love it, of course! But if you’re a fan of Benny’s, Avraham Fried, (the past 15 years at least), or just enjoy good music, this album is what you’re looking for this fall!! Interesting review. It’s clear this CD had more diversity then the first one and that’s why some people don’t like certain songs had some love those same ones. Shalom Aleichem is one of my favorites on this CD!! Also. It would be smarter if you wouldn’t use the blanket term “techno” for electronic songs. Techno is a style of eletronic based music. This song is far from techno. I’d say if anything it’s dance. But either way, the style you’ve mentioned you don’t like before is called electronic. It’s interesting to note its also been almost all eletronic songs that have been hits in the music world in last few years. Hentalach, weber Chabad song, omar rabbi akiva mbd, lipa kivoido, Gertner haposeach, ashrei mi, no lyrics, almost any Eli Gerstner fast song, Waldner Simon tov, yaalili, 8th day mazel tov, taussig new (and best) version of bum bum, Even frieds hofachta and Shwekey cry no more are very eletronic based. My point is that’s popular Jewish music today whether a purist (respect!) like yourself agrees or not. Great review!!!! I just want to disagree with you about you opinion on the first song, you wrote “The first song is the first impression of any album, and I wouldn’t have thought that ‘techno’ is the desired impression of this album.” Well this is the thing you are right that the first song does give a first impression of a album, and this song was the best choice as a opener track, look what became of this song A SMASHING HIT!!! were ever you go people are singing this song, every wedding is playing this song, and its no question that its a phenomenal song, so if you ask me it was the best decision!!!! thanks again a great review, there is more to argue but this is enough for now!!!! And what makes it even cooler is that the N in Friedman on the cover is a sideways 2, and you don’t even notice it at first. Here is something very interesting, you write a review but almost every song you write ” not my taste” so I am a little confused!!! Now the song shalom Aleichem the one song you didn’t comment is one of the best songs on the album. MBD has a song called SAMCHEM from double album, that song has 3 words (samchem bevinyan sholeim) and it became a hit until today, so by the comment of yours on mamleches kohanim about too little words and repetitive is not a chisaron in the song. the song dor achron is a test to each person, what I mean is if you like the song then you know you still like the old jewish music, if not you lost the yiddisher feel, and its a great song my opinion!!! But again great review, and this album is definitely on the top if my list its a fantastic album!!!!!! !